The Washburn EA180 TS is a fantastic concert body guitar featuring a Venetian cutaway for improved playability. Also, we are very proud to s.. The Washburn EA180 TS is a fantastic concert body guitar featuring a Venetian cutaway for improved playability. Also, we are very proud to say that the EA180 is a PMT Exclusive. Washburn have designed the Festival series of guitars to specifically address the needs of performing musicians and has succeeded in doing so for nearly 30 years. The Festival series was the standard acoustic/electro-acoustic guitar seen on MTV’s classic “MTV Unplugged” TV series and it is now one of the best-selling guitars on the market. The large body combined with high quality electronics, hardware and fine woods offer crystal clear highs to blend beautifully with full, well-rounded lows. 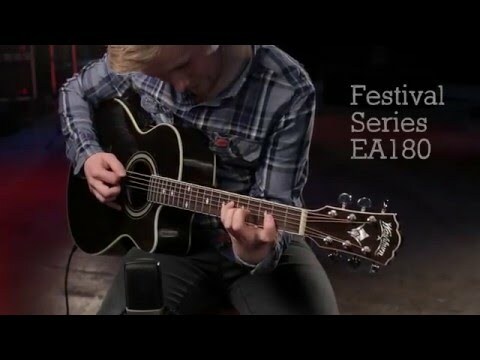 The EA180TS is a concert body electro-acoustic guitar with a Venetian cutaway. The cutaway allows for easy reach of the higher frets; perfect for solos and more adventurous lead melodies. The ash top is adorned with an abalone soundhole rosette and features archtop construction. The neck is made of catalpa while the fingerboard and bridge are made of rosewood – leading to enhanced transfer of the strings vibrations to the soundboard. The EA180 TS features a Fishman Isys+ 301T preamp system which has a built-in tuner so you don’t have to worry about taking a long a separate tuner wherever you take your guitar. It also features a phase switch so you can easily eliminate feedback when playing live and a two band EQ system so you can adjust bass and treble to tailor the tone to your liking. Chrome diecast tuners allow for quick, easy, precise and stable tuning while the nut and bridge saddle are made of NuBone. Looking great in a Tobacco Sunburst finish, the EA180 brings you an impressive combination of awesome playability, electronics and affordability.